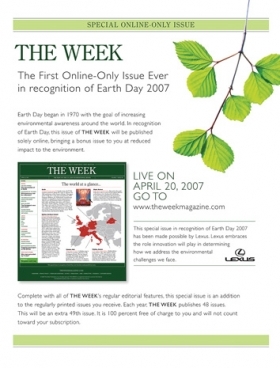 Lexus sponsored this environment-themed issue of The Week magazine. Automotive marketers are sending magazine publishers a strong, clear message: Give us more - a whole lot more - than just a page of print advertising. Car companies spent about $1.84 billion to advertise in U.S. magazines last year - down 13.3 percent from 2005, according to TNS Media Intelligence. Several major automakers say their magazine ad budgets will be flat at best this year. Last year, Ford division and Hachette Filipacchi Media U.S. created a nine-month initiative aimed at promoting the Fusion sedan to women. The campaign inspired the magazine company to create an event marketing unit. Some marketers who turn to the unit may never buy a print ad, says the executive who heads the new group. Toyota Division is creating customized advertising in Complex magazine, which appeals to young urban men. Each boldly graphic ad for the Toyota Yaris appears just once in the magazine. That's an about-face from traditional mass media campaigns that rely on repetition of images and tag lines. Last month, Lexus sponsored an environment-themed edition of The Week magazine. But the issue never landed in mailboxes. In keeping with its eco-friendly message, the magazine was published entirely online. "We are partnering more with those print magazines that are offering to connect with customers in relevant and unique ways," says Lexus media manager Andrea Lim. She handles media planning and buying for Toyota's luxury brand. Lexus is spending less on magazine advertising this year than last year, Lim says, declining to provide figures. But the brand is spending more on online magazine programs, she says. "If you think of the ways consumers today want to receive information, you have to become more portable," Lim told Automotive News. "People still like paper and looking at the beautiful content. But we want messages to be seen and to be relevant where people want to get them." Lexus approached The Week last year about the environmental promotion. It sought a marketing tie-in to Earth Day to promote its hybrid vehicles, including the RX 400h SUV, GS 450h sedan and LS 600h L sedan that is due in July. The magazine's Web site, theweekmagazine.com, directed visitors to Lexus' site, lexus.com. It included an "EcoFact Map" that detailed global efforts to aid the environment, accompanied by a Lexus ad. Automotive marketers say they want the magazines in which they advertise to create ways for consumers to interact with their brands. GMC and Time Inc. created a promotion for the GMC Sierra pickup that included print, online and live venues. It included a six-page 3-D advertising section in this year's Sports Illustrated swimsuit issue, which had a distribution of 4.5 million copies. Jeep placed an eight-page promotional section in Complex magazine that features professional athletes traveling through Southern California in a Patriot. Consumers could use GMC-branded 3-D glasses included with the issue "that allowed the car images to pop out of the pages," says Ayana Waddell, GMC's assistant advertising manager. They also could use the glasses for online viewing of moving 3-D images. "We were part of the swimsuit issue release party Feb. 14 at the L.A. Pacific Design Center," Waddell adds. "The swimsuit models arrived in GMC vehicles. We are looking to integrate the book to online and to the party itself, so consumers can interact with our product and not just see a one-page ad. We'll always look for these opportunities." GMC is spending heavily in magazines in the first half of 2007 to launch the Acadia crossover, Waddell says. She would not detail spending. Magazine publishers are offering consumers more real-world and online experiences on behalf of their automotive clients. In January, Car and Driver and Road & Track magazines began posting manufacturer-sponsored "virtual test drives" on their Web sites, caranddriver.com and roadandtrack.com. Visitors to those sites can test the 2007 Chevrolet Silverado pickup, Chevrolet Cobalt SS car and Ford Edge crossover. By year end, the test drives will cover 20 vehicles, says Robert Ames, online general manager for Hachette Filipacchi, which publishes the enthusiast magazines. Ames says the average viewer spends 3 minutes and 30 seconds viewing the test drives - nearly the entire length of the spots. "We were a little nervous about making a video that long," Ames says. "But people are watching them almost all the way through." The magazines' Web pages link the test drives to dealer locaters, product information and automaker Web sites. In May 2006, Hachette Filipacchi created an event marketing unit to handle advertisers' demands for more extensive programs. Al Silvestri, Hachette's vice president of corporate marketing and creative services, heads the unit. "Automotive companies are looking for creative thinkers," Silvestri says. "They lean toward companies that are willing to break the rules." The pursuit by automakers and magazines for new consumer experiences also extends to cell phones and similar devices. For example, Mercedes-Benz sponsored Car and Driver reports from last month's New York auto show that were delivered to cell phones and wireless devices. The magazine customized photos for the small screens. Rich Antoniello, publisher of Complex magazine, says publications such as his must provide venues to automakers for "the deeper story you need to tell consumers to sell a vehicle." "You can't do that on a single page," he says. "Advertisers want to go beyond the page." The June/July issue of Complex will include a guidebook to Los Angeles that the magazine developed with Cadillac, Antoniello notes. "How do you reach younger guys and do it in a really relevant way?" he says. "This is the most brand-conscious audience ever, but the least brand-loyal at the same time. They are being pounded by so many more media in general." Magazines are becoming brand matchmakers, offering their readers to auto marketers that seek to reach targeted audiences. The current issue of Complex includes an eight-page promotional section that teams the Jeep Patriot with Quiksilver, a sports apparel company. It features professional athletes traveling through Southern California in a Patriot. The section highlights restaurants, bars and other destinations in the region. Jeep "wanted a tie-in with action sports," Antonielli says. "Instead of buying an athlete to drive the car, we said: 'Let's align (Jeep) with a brand that most people in this country align with the ultimate in surfing. That's Quiksilver'." Bob Moran, director of sales and business development at Meredith Corp., cites Hyundai's expectations as a sponsor of last month's 2007 Family Circle Cup, a women's professional tennis tournament in Charleston, S.C. Meredith publishes Family Circle magazine. Hyundai "challenged us to do a couple of different things," Moran says. "Raise awareness in an upscale market. Put drivers in the seats of the car. And they wanted a cause-related tie to the community that dealers could participate in." GMC's Waddell says broad multimedia strategies are the future of automotive marketing. Says Waddell: "Where we can fully integrate, that is very important to us in communicating our message to the consumer."